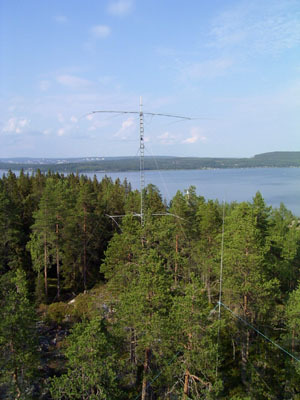 This yagi made by Hy-gain was first going to be used as a fixed antenna towards Europe but it got outperformed so much by the 6el tribander that I decided to turn it around towards JA instead. I simply didnt have it high enough when it was fixed at Europe because the takeoff the 6el tribander has got is great into that path. Towards JA the hilltop drops very rapidly which really make the 3el perform well. I was going to sell the antenna when I decided to keep it. Plans are to put a powersplit between the 3el and 4el aswell. 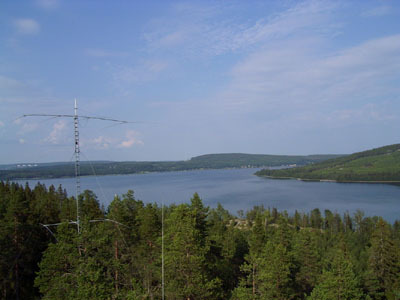 Up here it happens that 20M opens up towards both JA and NA during the nights on 20m if conditions are really great. The antenna is mounted on a homebrew sidemount so I can quite simply move the antenna into other directions aswell. 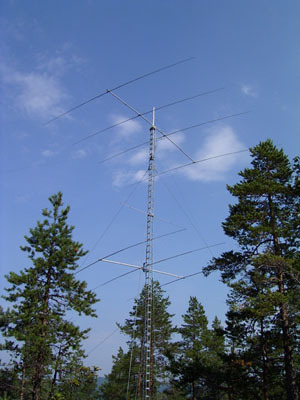 You can see some pictures of the antenna below. On these pictures the 3el is pointing towards UA though, but now its moved towards JA, I have simply not bothered taking new pictures since the old ones were so good.